AN ART INSTALLATION remembering the children who died in Ireland’s Mother and Baby centres has gone up in flames in Temple Bar this evening. Pictures have circulated showing the artwork, which was unveiled by councillor Mannix Flynn in November last year, on fire. The feature, which is located on the corner of Essex Street and Exchange Street in Temple Bar, had listed hundreds of names of children who were deemed ‘illegitimate’ by the State. Councillor Flynn said it’s a great shame that the fire has started and said he hopes “that it can be salvaged”. 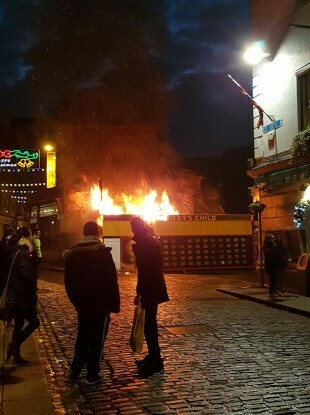 Dublin Fire Brigade confirmed they had received calls about a fire in the Exchange street area this evening. Email “'It was targeted': 'Somebody's Child' exhibition in Temple Bar in flames”. Feedback on “'It was targeted': 'Somebody's Child' exhibition in Temple Bar in flames”.